No. 6537-6538, Jalan Raja Uda, 12300 Butterworth, Penang, Malaysia. Kita Packaging Sdn. Bhd. is expert in planning, design, and manufacturing of various packaging automation machines used in food, electronics, medical, and major industries. 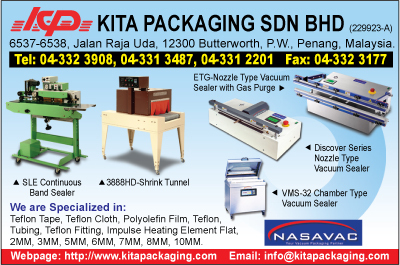 With successful installation and manufacturing of many machines both locally and overseas, Kita Packaging Sdn. Bhd. is recognized as a trusted source for high performance packaging automation machines. Our extensive knowledge and experience have proven our ability to achieve dynamic results through the implementation and combination of solidly structured, precise, reliable, and safety-engineered equipment. Through continuous research and development, Kita Packaging Sdn. Bhd. offers our customers with the latest packaging technology, as well as the best equipment and setup for customers packaging requirements. Our outstanding engineers provide the customers with total technical service including: project analysis; planning; equipment design and manufacturing; installation; start-up; and operation training, all of which lead to a system with the productivity our customer desire. Our machines are backed by our performance warranty, and our reputation in the industry.